Welcome to Dolphan’s Tale. A fun and Exciting new undersea adventure game with colorful animation and wonderful sounds. Dive into this deep sea full of life and explore the depths with your new found dolphan freinds. Three or more scatter symbols in any position starts the freespin bonus. 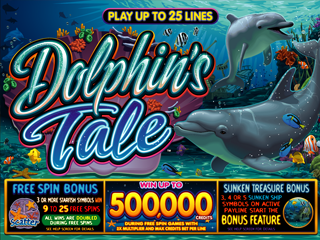 win 9-25 free games all line winsa re doubled during the freespin round reveal reveal cash prizes for every dive. 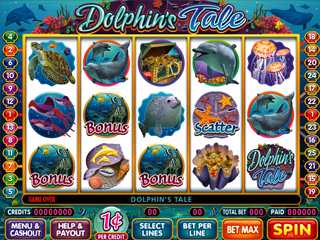 Three or more scatter symbols on an active payline trigger sunken tresure bonus.Find the hidden tresure to reveal your prize. Awards are based on number os bonus symbols that triggerd the bonus round.